William Scearce, 1771-1830, and his wife, Anna Thompson, 1777-1847. Woodford County, Kentucky. 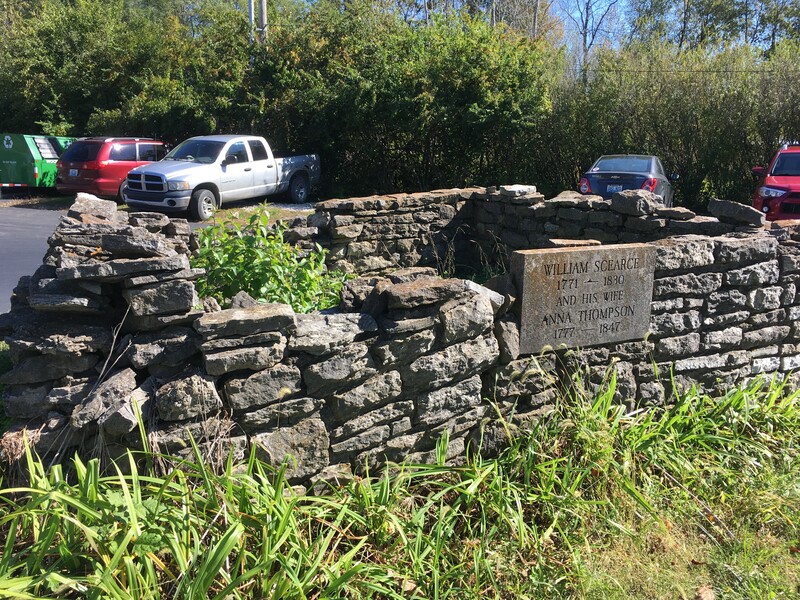 The small rectangular rock fence that surrounds the last resting place of William Scearce and wife, Anna Thompson, is located off Hwy 169 in Woodford County. As you can see from the photos one end looks fairly strong and complete, the other end is a jumble of rocks, but still complete. As there are no gravestones in the little plot, a gravestone on the front side gives us names and dates. 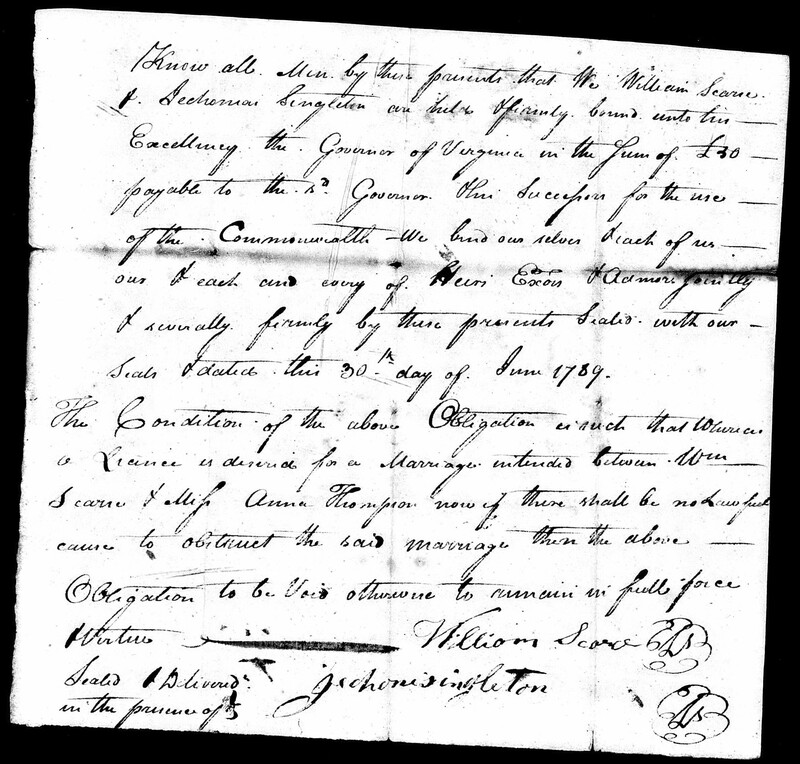 William, along with Jeconiah Singleton as his bondsman, received a marriage bond on June 30, 1789, for his marriage to Anna Thompson. I don’t know if you read the entire marriage bond for each one I post, but even though there is a standard used by most county clerks, a few are have their differences. For example, this one, when talking about the bond of fifty pounds, says it is ‘for the use of the Commonwealth’. I have not seen that phrase used. Know all men by these presents that we, William Scearce and Jeconiah Singleton, are held and firmly bound unto his Excellency, the Governor of Virginia, in the sum of fifty pounds, payable to the said Governor and his successors for the use of the Commonwealth. We bind ourselves, and each of us and each and every of heirs, executors and administrators, jointly and severally, firmly by these presents, sealed with our seals and dated this 30th day of June 1789. The condition of the above obligation is such that whereas a license is desired for a marriage intended between William Scearce and Miss Anna Thompson. Now if there shall be no lawful cause to obstruct the said marriage then the above obligation to be void, otherwise to remain in full force and virtue. And the wording of the consent was a little different – ‘my daughter has given herself to him in the bonds of wedlock and desires to obtain a proper license to confirm the same’. I do know that many times in he very early days of Kentucky a man and his intended might live together until a minister came through to marry them. However, Anna’s father, David Thompson, was a Baptist minister. David Thompson perhaps made an unusual choice of words. Sir, Mr. Scearce informs me that my daughter has given herself to him in the bonds of wedlock and desires to obtain a proper license to confirm the same. These lines may inform you that I have no objection. Given under my hand this 28 day of June 1789. 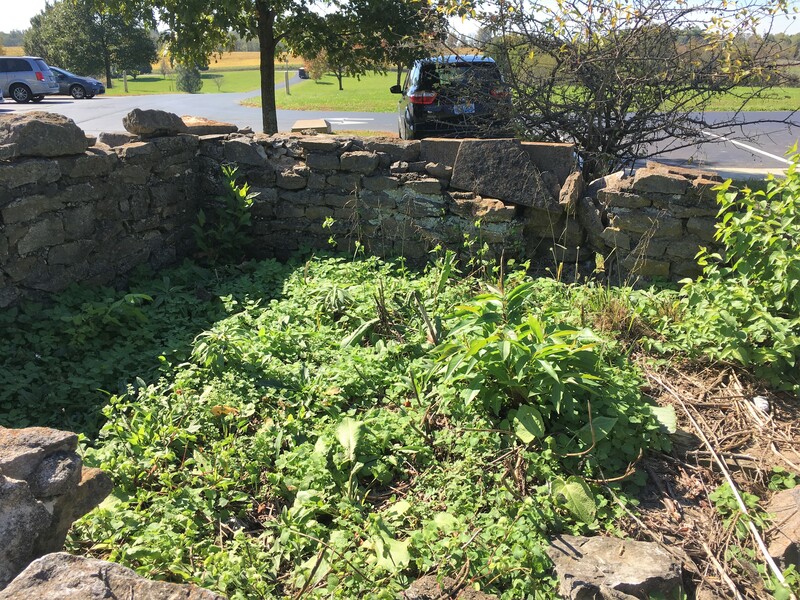 Among the early pioneers who came to Woodford County after the Revolution was that of the family of Scearce. They came from England and settled in Prince George’s County, Maryland, later to Virginia, and then to Kentucky. James Scearce and his wife, Henrietta, and their children, in company with David Scearce and his wife, Cassandra, settled near Craig’s Fort, about three miles from Versailles. The above James Scearce and his son, William, were among the early surveyors of that section. The children of James and Henrietta Scearce were: William, born in Virginia in 1771, married Anna Thompson, daughter of David Thompson, a Baptist minister from Louisa County, Virginia; Nathan, born 1773, and Henry, born 1775. They married sisters, Letitia and Rebecca Weakley, and moved to Shelby County; Robert Scearce married his cousin, Katherine Scearce; Elizabeth married John T. Minter, and Sallie Scearce. 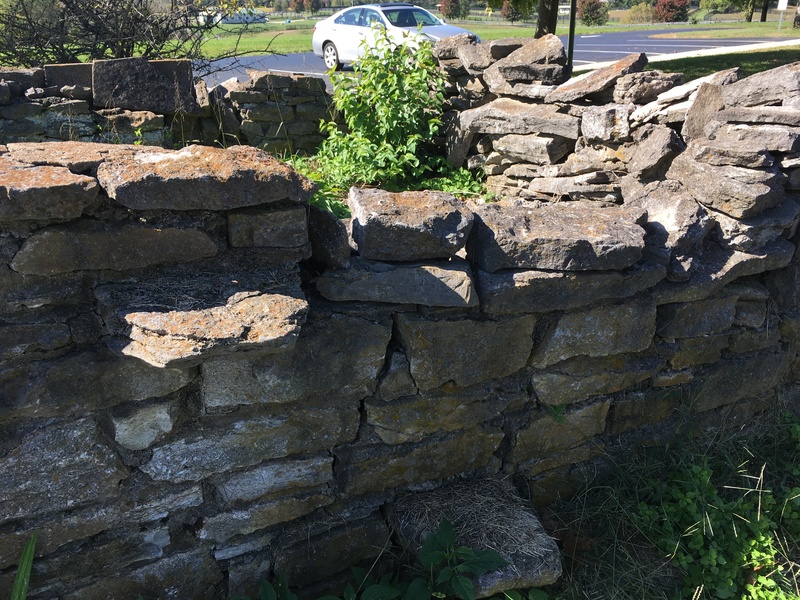 The children of William Scearce and Anna Thompson were: James, married Maria Cluke; Henry, married first America Berry, second Elizabeth Thompson; John, married Elizabeth Middleton, and moved to Shelby County; Laban, married Jane Ashurt; Patsy, married Caleb Baker, and moved to Missouri. 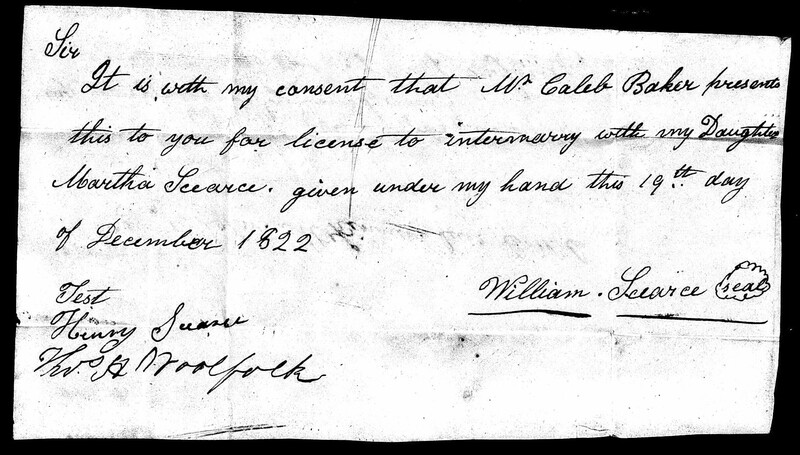 One more marriage consent – that of William Scearce for his youngest daughter, Martha, to marry Caleb Baker. Sir, it is with my consent that Mr. Caleb Baker presents this to you for license to intermarry with my daughter, Martha Scearce. Given under my hand this 19th day of December 1822. I do not have a copy of William Scearce’s will, but it is located in Will Book H, Page 438, in Woodford County. The will was written September 16, 1830, and witnessed by Willis Field, Benjamin Hiter and Robert Sacra; probated in October of 1830. 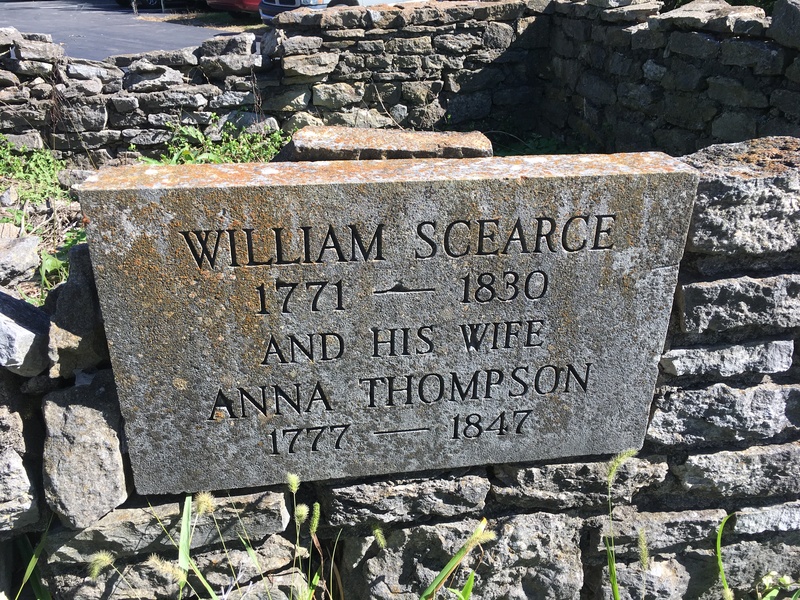 William Scearce, at the relatively young age of 59, knew his time was close and made his wife, Anna, and sons John and Henry, executrix and executors of his last will and testament. The notation reads ‘equal at death of wife’. After William’s death in the fall of 1830, Anna lived another seventeen years.